Geoff Grinstein, a physicist, born and raised in Montreal, has a B.Sc. from McGill University, and M.S. and Ph.D. degrees from Harvard. 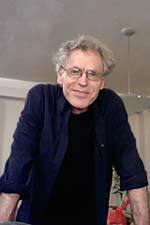 The author or co-author of over 100 published, peer-reviewed scientific articles, Grinstein has taught at the University of Illinois at Urbana-Champaign, at NORDITA in Copenhagen, and at Yale University, and has given scientific lectures at laboratories and conferences around the world. He was a Research Staff Member at IBM's T.J. Watson Research Center in Yorktown Heights, New York from 1979 until 2008, and is a Fellow of the American Physical Society. He has a longstanding interest in the way science is portrayed in works of fiction and on stage.